OutsidePursuits.com recently announced the results of their Editors' choice awards for the top rated ski and snowboard jackets. APOLLO BEACH, Fla. - Nov. 27, 2017 - PRLog -- OutsidePursuits review editors chose the following ski jackets after extensive testing in various conditions. The ski jackets were rated on, warmth, fit and durability. The Carto Jacket is a 3-1 ski/snowboard jacket that continues The North Face's tradition of quality gear at reasonable prices. The Carto jacket features a breathable HyVent 2L shell and is paired with their "Heatseeker" insulated liner makes it one of the warmest jackets available. The Squaw Valley ski jacket is one of Spyder's least expensive offerings but is still a worthy contender. The Squaw Valley has 80 grams of 3M Thinsulate insulation so it's a very warm jacket. It does not however not have a removable liner like many other jackets keeping it in 2nd place. The Squaw Valley jacket is 100% waterproof with its "Spylon" coating, waterproof zippers and taped seams. The Whirlibird Interchange Jacket has a nylon outer shell with "critical seam taping" is completely waterproof and has Columbia's "Omni-Heat" polyester insulation. 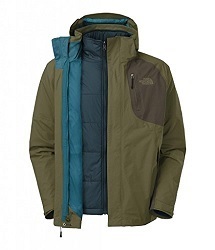 It also features a removable hood and an adjustable powder skirt makes this a feature rich, bargain priced ski jacket. Headquartered in Brandon FL, OutsidePursuits LLC does extensive side by side testing of outdoor gear. The website is a free to the public resource for anyone who loves the outdoors. The website has several categories of equipment reviews, including: Scuba Diving, Biking, Camping, Hiking and Kayaking.